What's the used Alfa Romeo Stelvio estate like? Making a sporty SUV is not as daft an idea as it initially sounds. Although the focus of these cars is very much on style and practicality, with comfort maybe taking precedence over performance and handling, evidence dating back to the 2003 Porsche Cayenne shows that they are an entirely feasible and profitable venture. Alfa Romeo has one of the most romantic of all motoring badges, and, despite it having a long (and chequered) history of family cars and sports cars, the Stelvio is its first modern SUV. It’s based on the same underpinnings as the Giulia, an impressive executive saloon that rivals cars such as the BMW 3 Series. The Stelvio is slightly taller than its main rival, the Porsche Macan, and a little shorter than the BMW X3. There’s plenty of aluminium in its body and suspension, keeping it light, and plenty of tech underneath, plus the option of rear-wheel drive on the 2.2 diesel with its lower-powered engine, as opposed to the four-wheel drive of all other models in the range. Talking of engines, there’s the choice of a 197bhp or 276bhp 2.0-litre petrol or a 178bhp or 207bhp 2.2-litre diesel. 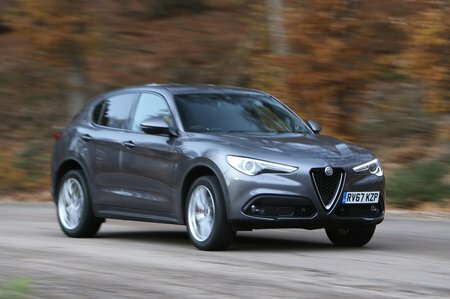 As far as trim levels go, the entry-level Stelvio model gets plenty of kit, including 17in alloy wheels, a leather steering wheel, a 6.5in-screen infotainment system, automatic emergency braking with pedestrian detection, cruise control, front and rear parking sensors, a powered tailgate and automatic lights and wipers. Super models get part-leather seats, a range of interior colour choices, 18in wheels and the option of Luxury or Sport packs. Business models gain sat-nav and xenon headlights, while range-topping Speciale features 19in, 10-spoke alloy wheels with red brake calipers, xenon headlights, power-folding door mirrors and heated leather seats in the front. You would expect any Alfa Romeo to be competent on the road, and the Stelvio is. In fact, like the Giulia, it’s better than that: it’s really very good. Performance with any of the engines is impressive, while in higher-powered petrol and diesel forms, it’s delightfully responsive and punchy. The only thing to note is that one or two of its rivals are a little quicker, including the Porsche Macan and equivalent Audi Q5. Where the Stelvio really shines is in its handling. It steers remarkably quickly - indeed, it might take drivers a little time to get to grips with it because it’s so darty - and handles with a fluidity that's rare in the SUV class. It has a firmer ride than its rivals, and this helps with body control in faster or tighter corners; the Stelvio always feels stable and secure, while being surprisingly good fun. The payoff is a ride quality that some will find too stiff - you certainly feel large bumps and potholes - but body pitch and roll are so well controlled that it also means this tall car is less disturbed by sudden changes of direction. It’s quite refined, too, but once again, one or two of its rivals are even quieter. That said, there are those who might find the extra noise welcome because it provides an air of the sportiness Alfa Romeos have always been renowned for. Inside is an excellent and multi-adjustable driving position, although rear visibility is slightly limited by the thick pillars and the small rear screen. The dashboard and its surroundings are attractively finished, with sporting touches here and there and a better choice of materials than we’re used to from Alfa Romeo. There is evidence of some cheaper plastics in one or two areas, though, so while it’s an attractive place to be, it can’t quite compete with some of its more premium rivals. The infotainment system, with its wide screen, is logical and easy to use, although it’s not as straightforward as the systems in the Q5 and X3. There’s plenty of space for a taller driver and front-seat passenger to stretch out, but rear space is limited, especially for six-footers sitting behind a tall driver, and the sloping roofline eats into head room. At 525 litres, the Stelvio’s boot trumps the Porsche Macan’s, but it can’t quite match the X3's. The load area is a usefully square shape with no internal load lip; it’s just a shame that there aren’t more hooks for bags or eyelets to hold loads down. The standard powered tailgate is handy, though. The Stelvio scored a full five stars in the Euro NCAP crash test, beating the likes of the Q5 and Mercedes-Benz GLC for adult protection. It’s behind those two rivals for child and pedestrian protection, although it narrowly beats the Q5 for safety assist systems (such as automatic emergency braking and lane departure warnings). Not only is the Stelvio protective in a crash, but it also comes with automatic braking with pedestrian detection and lane departure warning as standard.